Here’s a quick guide to toilet height: why it’s important that your toilet is raised to the right level — or not, as the case may be — how to get the toilet to the right height and what to do if you can’t get your toilet to your desired height. Making sure your toilet is at the right height for any given person’s needs is essential to providing comfort and security in the bathroom. 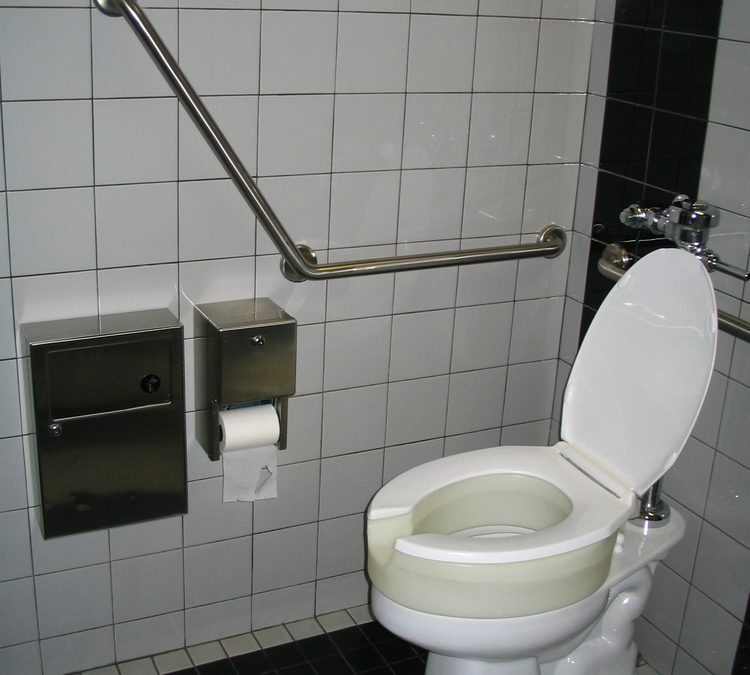 For individuals with disabilities, it may be that a range of toilet aids should be put in place — from safety rails to hold on to, through to moveable toilet frames to ease lowering yourself onto the toilet. But the height of the toilet is critical, as sitting on a toilet that is at the wrong height for your personal needs and circumstances can cause trouble for your body and even exacerbate existing aches or pains. In the same way that children are encouraged to sit with good posture, so too should you sit as comfortably and as correctly as possible — always keeping in mind that what’s right for one person may not be correct for another. What Size Should a Disabled Toilet Be? There are no hard and fast rules for this. There isn’t a one-size-fits-all solution for toilets for people with disabilities and that’s simply because every person is different. The only way to work out how high a disabled toilet should be is to sit on the toilet bowl and think about how comfortable you are and at what angles your knees and hips are bending. Usually, if you put your feet flat on the floor, you want your knees and hips to be at the same height. Your thighs should be horizontal. If your knees are higher than your hips, your toilet is too low and if your knees are lower than your hips, the toilet is too high. You can measure whether your toilet is too high or low without having to sit on it as well. The rough guide here is to match the toilet height to a measurement taken from the user’s foot sole to the back of the knee. This way, the user’s thigh should, in theory, be straight when using the toilet. What if the Toilet Height Is Wrong for You? If the toilet seat height is just off, you can simply buy a new toilet seat that’s a little thicker or thinner, depending on what you need. It’s far more likely, however, that a higher seat is needed for an elderly person or someone with limited mobility. The reason for this is that it’s important a person who struggles to rise from a seated position does not sit too far down. Sometimes it is worth compromising on toilet height if there’s a chance the damage caused by not having a perfectly straight thigh while seated is overshadowed by the real possibility of the user not being able to return to a standing position. There is a large range of specialist equipment that can be used to raise the height of a toilet. Most of this equipment looks like a variation on an oversized toilet seat and how it fastens to the toilet bowl or existing seat differs according to the quality of the product and the difference in height. For example, this Senator Raised Toilet Seat raises the user four inches and connects to the toilet using rubberised moulds and pads to securely fasten it to the majority of standard, rounded toilets. In contrast, the Linton Plus Raised Toilet Seat uses a plastic screw clamp to affix to the toilet. Simpler designs also exist, such as the clip-on Novelle Raised Toilet Seat. You should always keep in mind the strength — i.e. how hard they find it to get up, due to reduced leg and back strength — as well as the body weight of the person using a product that raises a toilet seat. It goes without saying that the higher a seat is, the easier it is to get up from it. But if a person is overweight or struggles with movement, it may be worth considering a toilet seat and frame. Adjustable toilet seats with a frame are even more practical, as not only do they help the user’s stability when lowering onto the toilet and getting back up afterwards, they can be used in multiple-person households where everyone requires some form of aid in the toilet. We sell a wide range of pull-ups and all-in-one incontinence pads for individuals who wish to have an added level of security if they aren’t always quick enough on their feet to make it to the bathroom. Our range of incontinence pad options is exhaustive and we are experts at advising on different product ranges for differing needs. Get in touch if you’re unsure about anything. We also have a selection of commodes so that you can bring the bathroom a little closer if necessary. Pay attention to posture and don’t forget that it’s possible that a higher toilet seat might make for higher levels of comfort for those who are prone to falls or who cannot rise to their feet very easily. Browse our complete range of toilet aids today.